In tests on human corpses and livestock after the American Civil War the US Army determined any bullet that can penetrate 3/4 of an inch of pine wood was potentially lethal while a bullet that could pierce a full inch of pine wood was quite capable of producing mortal wounds. As shown in the other post the 442 Webley moves a 100 feet per second than does the .44 Bulldog cartridge. 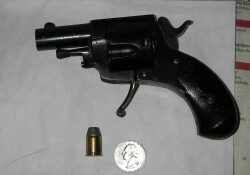 I therefore tested both for wood penetration in pine boards from two different 1870s – 1880 period Bulldog revolvers.